As the (ridiculously) short winter in Texas appears to be giving way to spring, it is that time of year when parents start signing their kids up for sports teams. Since we live in a large metropolitan area, we have the luxury of choosing almost any sport at any time of year. Football, baseball, soccer, and basketball are virtually year-round activities here. At least once a year, my wife and I have a discussion about which activities to place our children in and for how long. For many people, sports are an unhealthy obsession, but sports can actually be good for the development of character—if done the right way. Here are a few thoughts on the character that sports can build and some caveats for parents to go along with them. While there are individual sports, we mostly think of team sports when we consider signing up our kids for a season. The beauty of such team sports is that they can counter the oppressive culture of individualism we often find in our society. Rather than spending time mindlessly staring at a screen with no consciousness of the world around them, children who play team sports get the opportunity to interact with other children in a (typically) competitive environment where they have to work together to accomplish a goal. The level of teamwork varies with the sport, but one thing is consistent—the team is essential. No single child can compete against an entire team and be successful. For that matter, not even LeBron James could take the basketball court by himself and compete with even a decent college-level team. Learning teamwork is important for our children because the “adult world” is full of interaction with others and collaboration to accomplish goals. From marriage to the workplace to church, we constantly interact with people for the sake of pursuing common goals. As a leader, Moses learned this lesson from his father-in-law in Exodus 18. Jethro came to visit Moses in the wilderness and to bring his wife and sons back to him. While there, Jethro observed that Moses was handling all the disputes of the people by himself and advised him against such an approach. Jethro counseled him to “select out of all the people able men who fear God, men of truth, those who hate dishonest gain; and you shall place these over them as leaders of thousands, of hundreds, of fifties and of tens. Let them judge the people at all times; and let it be that every major dispute they will bring to you, but every minor dispute they themselves will judge. So it will be easier for you, and they will bear the burden with you. If you do this thing and God so commands you, then you will be able to endure, and all these people also will go to their place in peace” (Ex 18:21–23). Even the prophet Moses needed a team to accomplish the goal of judging the people and bringing them into the Promised Land. Children’s sports sometimes bring out the worst in parents. Many of us consider our child to be the next Peyton Manning, Derek Jeter, or Michael Jordan. However, our kids still need a team. They also need a team that respects them. When parents grandstand for their own child to be the focal point of the team, it actually does the child and the team a disservice. Camaraderie, selflessness, and unity are necessary for success on the field and in life. Even the most talented team can lose to another team that has learned to play together. Instead of promoting your own child, promote the team. I’ll never forget one of the coaches from my childhood. I didn’t really like him very much. He made us run long distances. If you were last, you might have to run another lap. He constantly worked on drills to teach skills. All I wanted to do was score (which I rarely did). Then he expected us to go home and work more between practices. I didn’t like what he required us to do. But he was teaching us the lesson of discipline. Discipline is important in life, and sports have a built-in mechanism for teaching it—practice. Most kids are not blessed with the athletic ability to pick up the intricacies of a new game the first time they play. Yes, it may come easier to some than others, but even the best athletes practice (unless you’re Allen Iverson). The discipline children learn in playing sports can translate to the rest of life. Schoolwork requires discipline. Jobs require discipline. Spiritual growth requires discipline. Thus, sports can help children learn the discipline necessary for life. Team sports in particular teach us that others are dependent upon us exercising our own discipline. The danger for parents when it comes to discipline in sports is the tendency to fall into one of two extremes. We can demand perfection from our children that they simply cannot deliver or we can let them off the hook of practice and discipline. By always demanding absolute perfection, we may drive our children away from a desire to participate. By giving in to the temptation not to require practice, we may send our kids a message that practice and discipline are not necessary. Both extremes are problematic. Balance in this area is necessary. One of my fondest sports memories came around the age of 9 or 10. I had been playing basketball in a church league for a few years already, but my church’s team was not very good. In fact, we had not won a game in more than two full seasons. But this game was different. By some miracle, we had actually taken the lead at the end of the game and just needed to run out the last few seconds on the clock. We were inbounding the ball from under the opponent’s basket and they were surrounding us to try to steal the ball. I broke open, caught the pass, and avoided the defense until time expired. We won! The taste of victory was sweet. It was even sweeter due to the lingering taste of defeat for more than two years. Losing is a part of sports. Very few teams go undefeated. Learning to lose is an important lesson for life. It teaches perseverance. People who fail to learn how to pick themselves up after defeat tend to struggle mightily in life. At some point, we will be passed over for a promotion, or someone will critique what we say or write, or someone will tell us that our idea is a bad one. What we do when that happens says a lot about our perseverance. Losing every game for two seasons was not fun, but most of our team stuck together. Over time we got better because we continued to discipline ourselves and trust one another. By the time we quit playing together in high school, we found ourselves in the city tournament. We as parents do not like to see our kids lose. As a result, some parents refuse to allow their children to play on a team that loses. At the first sign of a season turning south, they will pull their child off the team in order to find a better one—often bad-mouthing the coach on the way out. Another possibility is to blame the losses on someone else and never acknowledge our child’s role in the team’s loss. That doesn’t mean we need to be hyper-critical of our children’s faults, but we need to teach them where they can improve. I’m sure I cost my basketball team a number of games due to my abysmal free throw shooting. But that is why I spent afternoons in the driveway shooting free throws—at my dad’s suggestion. Failure is not fun, but it may be the best teacher. This spring and summer, we will most likely have our kids in different sports and activities. I may even coach one of them. I hope they are successful, but I am more hopeful that they learn teamwork, discipline, and perseverance. Those are life skills they will take with them long after their days on the field or court are over. 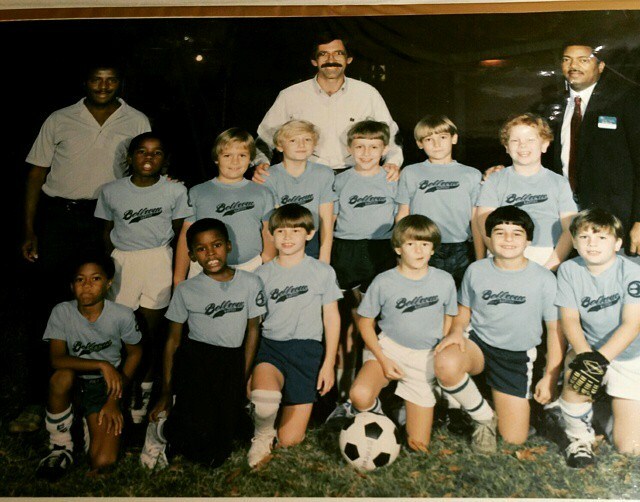 *Thanks to my friend and former teammate Achaz Foster for the “throwback” photo of one of our soccer teams back in the day. Yes, I’m the chunky kids second from the left on the back row.